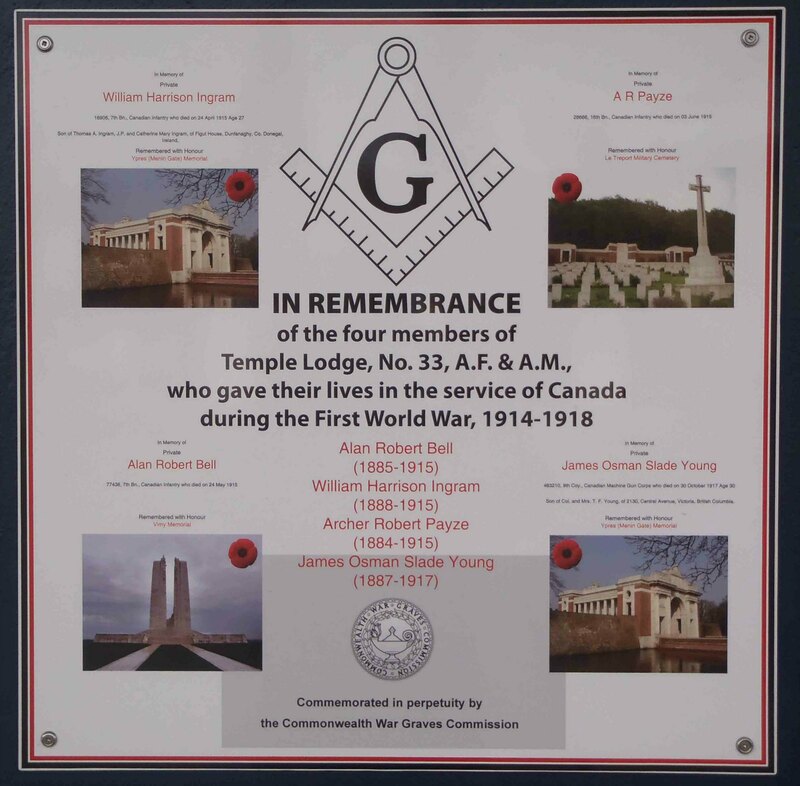 First World War Memorial Plaques – Temple Lodge, No.33, Duncan, B.C. In 1920, Temple Lodge, No. 33 placed a solid bronze commemorative plaque at the entrance to the Duncan Masonic Temple to commemorate the four members of Temple Lodge, No. 33 who died while serving in the Canadian military in France during the First World War. We removed this plaque from the exterior of the Duncan Masonic Temple in 2013 after receiving credible information that it might be targeted for theft due to the scrap value of the solid bronze from which it was cast. 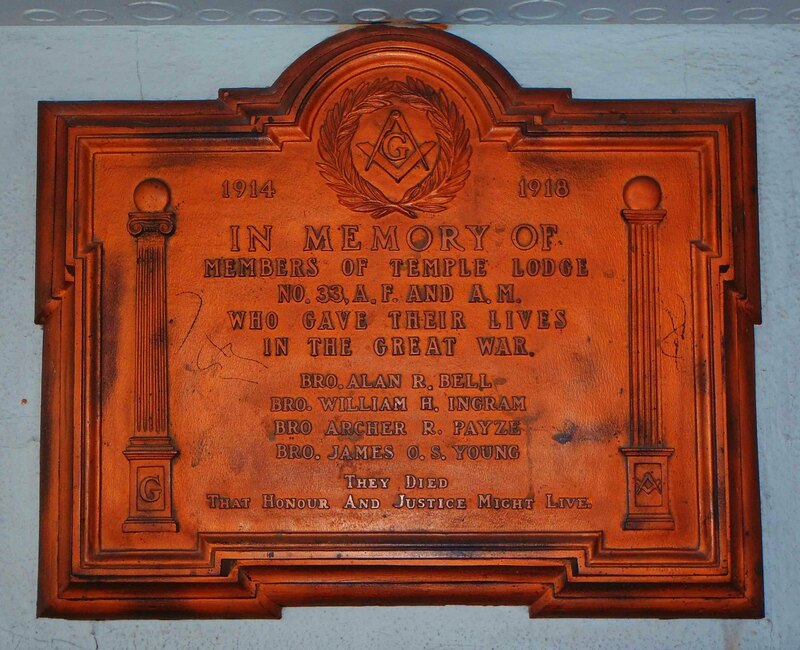 We replaced this plaque with a new sign at the entrance to the Duncan Masonic Temple commemorating the four members of Temple Lodge who died in Canada’s military service during the First World War. This sign was designed by Bro. Paul Philcox (Lt. Col. retd.) and unveiled in a formal public ceremony on 11 November 2013 by W.Bro Mark Anderson (W.M. – 2013-1015) and City of Duncan Mayor Phil Kent. On November 11, 2014 Temple Lodge, No.33 placed a second sign at the entrance to the Duncan Masonic Temple to commemorate the members of Temple Lodge, No. 33 who served in Canada’s military during the First World War. This sign was unveiled in a public ceremony by W. Bro. Mark Anderson (W.M. – 2013-15), the local Member of Parliament, Jean Crowder, the local M.L.A., Bill Routley and the Mayor of Duncan, Phil Kent. Here is the plaque commemorating Brothers Alan Robert Bell, William Harrison Ingram, Archer Robert Payze and James Osman Slade Young, who died in Canada’s military service during the First World War (1914-1918). This plaque was unveiled in 11 November 2013. Plaque at the Duncan Masonic Temple entrance commenmorating the four Brethren of Temple Lodge No. 33 who died in Canada’s military service during the First World War. The plaque was unveiled 11 November 2013. 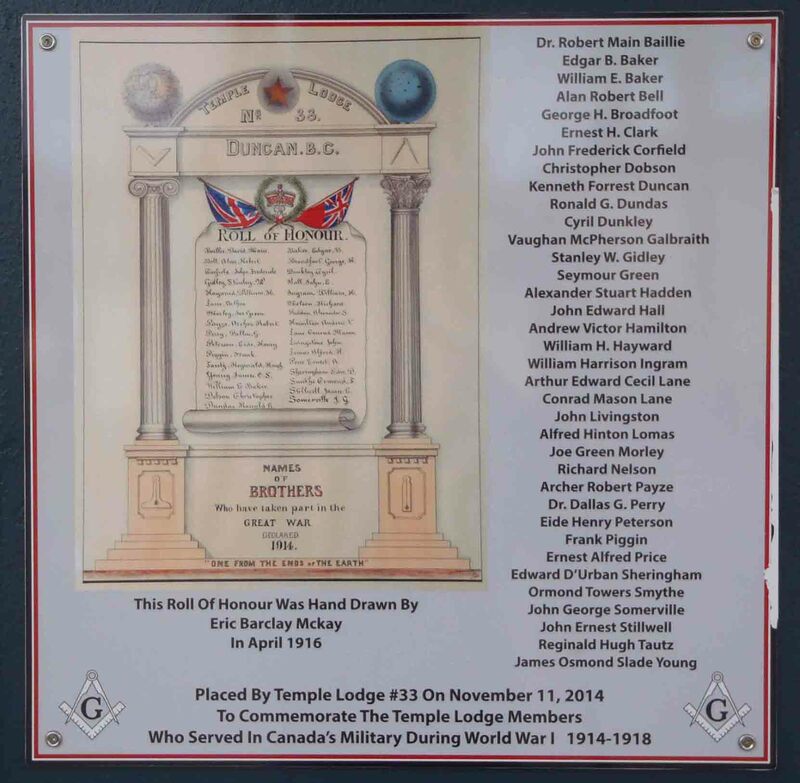 Here is the plaque commemorating the members of Temple Lodge, No.33 who served in the Canadian military during the First World War (1914-1918). This plaque was unveiled in 11 November 2014. Note: these are the names we are currently aware of. We will add any additional names to this list as future research dictates. 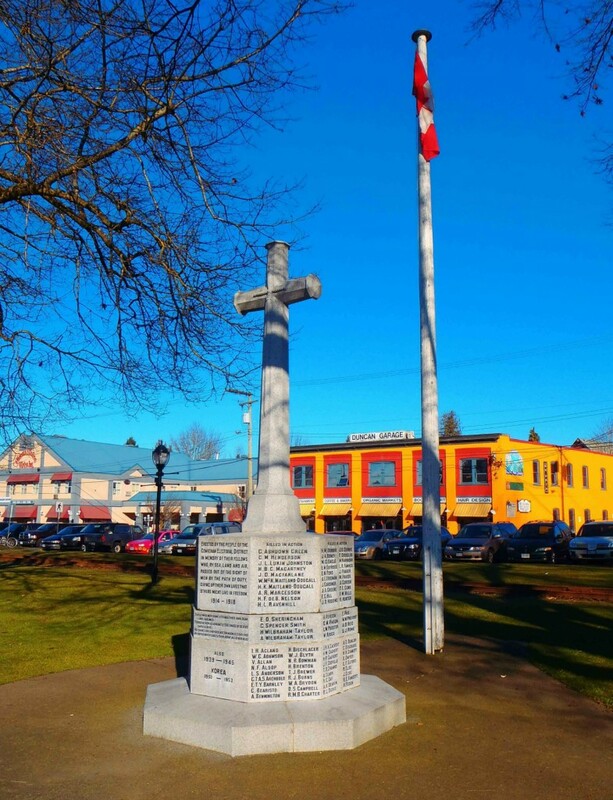 Cenotaph, Charles Hoey Park, Duncan, B.C. The names of four Brethren of Temple Lodge, No.33 appear on the Cenotaph.